MEMPHIS, TN (January 4, 2013) Nine Church of God in Christ churches that have been damaged by Hurricane Sandy will receive assistance. 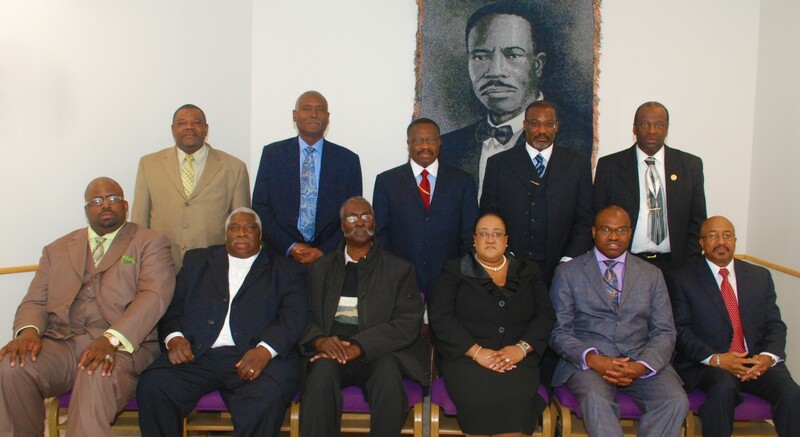 FRONT (L-R): Pastor Thomas Michael, Sr. (New Redeemed Pentecostal Temple COGIC, Atlantic City, NJ); Pastor Buddy Williams (Gethsemane COGIC, Inwood, NY); Pastor James Pelt (Highway COGIC, Far Rockaway, NY); Dr. Sylvia Green-Testamark (Community COGIC, Arvene, NY); Pastor Mark Beavers (Harvest on the Atlantic-Soul Stirring COGIC, Island Park, NY); Pastor Bennie Moorer (Bethlehem COGIC, Rockaway Beach, NY). REAR (L-R): Pastor Simeon Harris (Living Proof COGIC, Bayshore, NY); Superintendent James Pullings, Jr. (Disaster Relief Coordinator); Bishop Frank O. White (General Board Member); Bishop Frank Anthone White (Financial Secretary, COGIC); Pastor John E. Kitchen, Sr. (Mt. Zion COGIC, Atlantic City, NJ). In October 2012 Hurricane Sandy devastated parts of the Caribbean, Mid-Atlantic and Northeastern United States. The storm became the largest and costliest Atlantic hurricane on record. The hurricane killed 125 people in the United States alone. An estimate of losses due to damage and business interruption is over $60 billion. About the Church of God in Christ.